I am so excited to find this product! 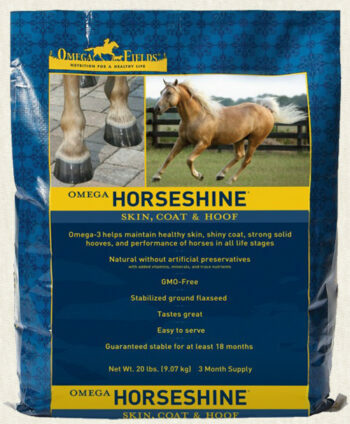 It is my sincere belief that Omega Horseshine is the best Omega 3 supplement money can buy because it is 99.9% pure Non-GMO human-food-grade stabilized ground flax with no sugar or molasses added, no corn or wheat or barley which are mostly non-structural carbs which turn to sugar when metabolized, no soy, no hydrogenated or partially hydrogenated vegetable fats or oils (trans fats), no chemical preservatives, and Omega Horseshine has an unbelievably low NSC rating of 4.4 (a measure of non-structural carbs). I have found no other Omega 3 supplement that meets all of these standards. None. And I’ve been reading a lot of labels. Most of them really scary. The search for this product began when I woke up and realized how important Omega 3s are to our horses (and to us as well). Omega 3s are essential for horses. Not just for shining on the outside but for shining on the inside too. Omega 3s fight inflammation, they are essential for a healthy robust immune system, they can improve bone and joint health, restore cracked and brittle hooves and support strong solid hoof growth, they can eliminate sweet itch and bug-bite sores, they are recommended for horses with insulin resistance and Cushings, and can reduce symptoms of metabolic syndrome, all while promoting shiny, healthy coats and smoother skin texture! Our Stormy looks like she has been shellacked. Seriously. It’s the shiniest winter coat I’ve ever seen. Every domestic horse on the planet needs Omega 3 supplementation because no one, horse or human, can manufacture their own Omega 3s. 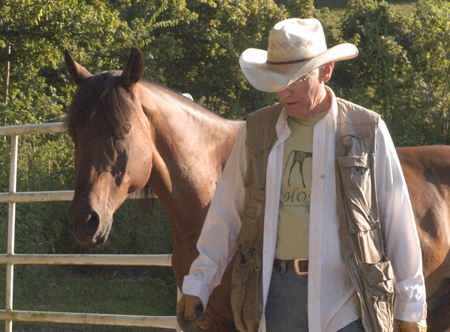 A horse in the wild will get his Omega 3 needs from the many varied kinds of fresh native grasses that have never been exposed to chemical fertilizers, pesticides, herbicides, and never been GMO’d. Domestic pastures virtually always come up short because they’ve been exposed to one or all of the above, and grass hay loses its Omega 3s when it is cut and dried, so the horse (like the human) needs Omega 3 supplementation. If you are currently supplementing Omega 3 using another product, I encourage you to read the label. I have for every major Omega 3 product out there. You will find no other brand using human-food-grade flax. Many don’t even use pure flax, opting for a less expensive and less effective flax by-product like flax meal. And virtually every other Omega 3 product will contain some combination of those sugars or grains that turn into sugar once inside your horse, or hydrogenated vegetable oils, or soy, and/or artificial (chemical) preservatives. Omega Horseshine is the only Omega 3 Supplement I have found that uses 99.9% pure Non-GMO human-food-grade stabilized flax! No one else does this. We are now using Omega Horseshine with all of our horses and Horseshine led me to Omega Nibblers-Low Sugar, which was really exciting because we train with treats and I always worried about the amount I was using and how much bad stuff I might be putting into our horses. But not anymore!